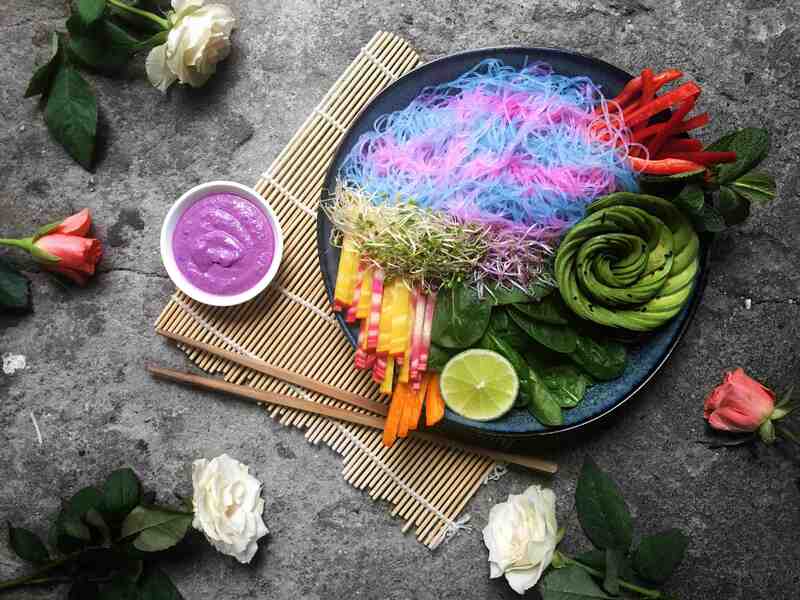 “Raw vegan sriracha?”, “And what’s up with the colour?” Are some of the questions I’m come to mind to some of you, well let me answer those! First of all I love cooked sauces, I adore them, but since my body is giving me signs (eczema) that something’s off I am trying to eat as “clean” as possible. To be honest I don’t even know what that means anymore, to eat “clean”, but one thing that comes to mind are raw foods, so even though I won’t be going fully raw or raw for a month, I will be implementing more raw foods into my diet, which is why this is a fun play on sriracha, but them raw. And if you’ve been following me for a while you might know I have a thing for colour, so that’s why it’s purple! For many of us sriracha has become a staple, sorry ketchup you’re just ain’t spicy enough, or at all! The thing with sriracha though is that even though I’ll still be using it occasionally I believe that making your own (whatever it is) is always the healthier option. This sauce can be made as hot as you please, I like mine extremely hot, but know not everyone will enjoy this kind of heat, so I used rawit peppers (aka bird’s eye chili) instead of adjuma peppers in this one, even though adjuma is my fave. The rawit peppers are a bit milder in heat (I still added 4 though) but feel free to add however much you can tolerate, maybe try using chili peppers, which are traditionally used in sriracha. You can also chose to skip the purple cabbage if you don’t care for colour, I mean the cabbage definitely doesn’t add to the taste. 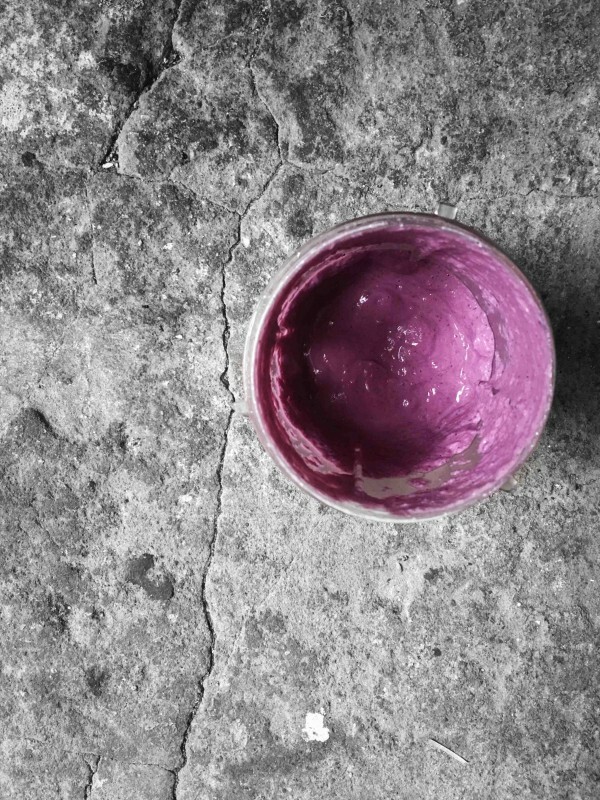 Having said that I don’t find it an unpleasant taste, and it does add some nutritional value, and that colour, I love it! As you can see I used it as a topping for one of my rainbowl, which by the way are a staple in my diet, if you haven’t noticed yet. Since I don’t want to get bored with eating them I create a different (raw) sauce to go along it almost every week, click on these links for the miso/beet sauce or peanut sauce. There will be many more where these came from! 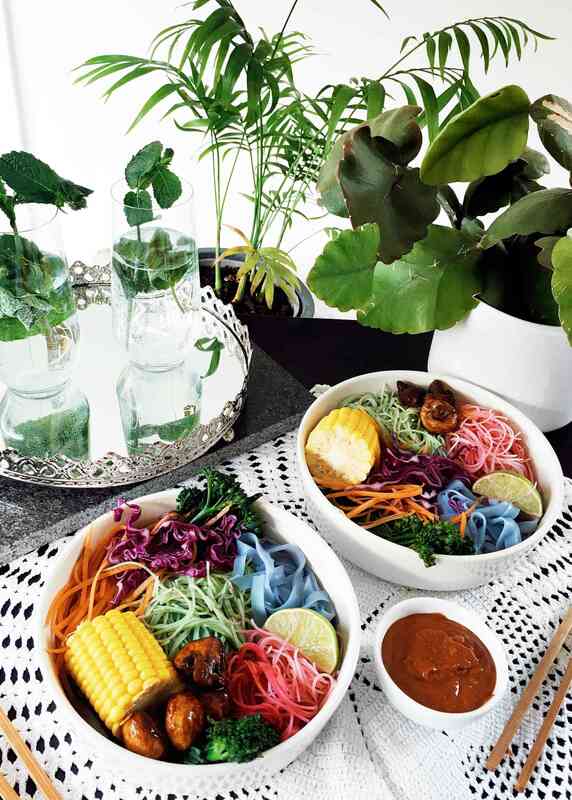 There’s something so fulfilling about eating a vibrant and colourful food, yup these kind of meals are good for body, mind and soul! Don’t get intimidated by the noodles you can find a super easy recipe for those noodles, over here and whatever else to add, that I leave up to you. Let your imagination run wild! Start by soaking the cashew nuts, I forget to soak them ahead of time so always do a quick soak by adding the cashew nuts to my bullet blender, adding just enough hot water to cover the nuts, letting them soak for 15 minutes. In the meanwhile you can do the dishes or something else. After the 15 minutes I add the remaining ingredients and blend it until smooth. I also add about 3 small splashes of hot water, one splash at the time until I reached my desired consistency. Keep it in your fridge, It should stay good for at least a week. Enjoy! 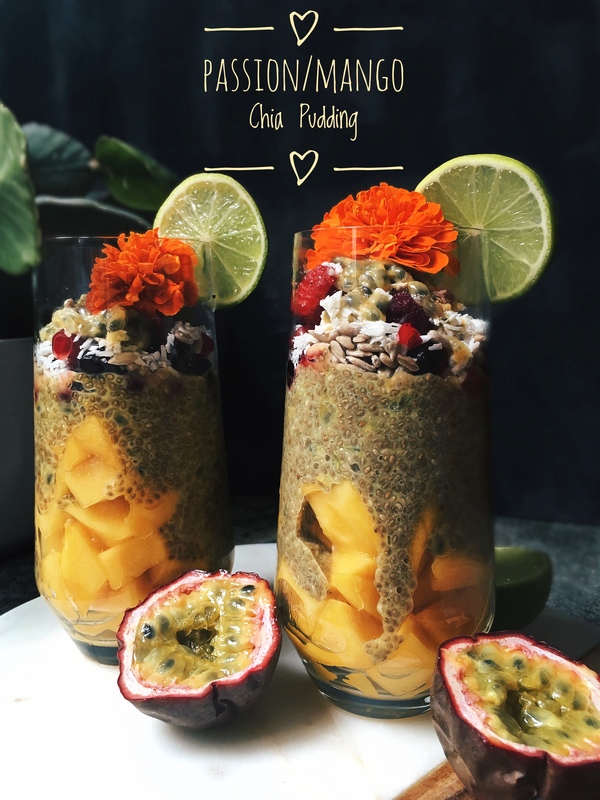 You might have noticed that I have a thing for rainbow foods, and especially when they are done with natural food colourings and aren’t only a pleasure for the eye but also nourishing to the body and soul. 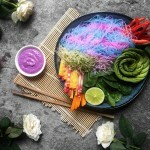 When I first went vegan it was mainly motivated by health and spiritual growth, and the more it became motivated by the ethical and environmental side of the vegan spectrum the more I stared to move away from my “healthy” approach and started eating everything as long as it was vegan. 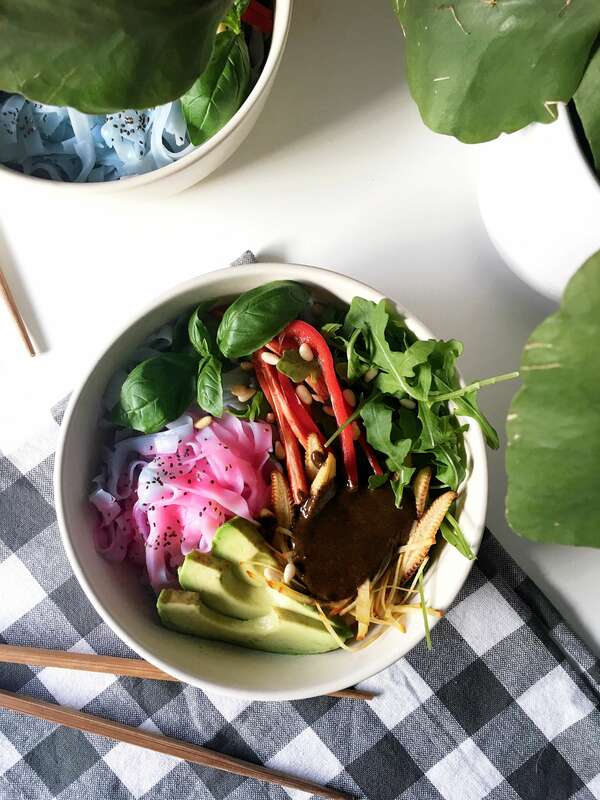 I’ll do a post on that whole subject on the near future and how my body did not agree with me on this approach, but for now I’ve come to the conclusion to focus on nourishing dishes to once more feed my body and soul, with some lifestyle tweaks here and there. Of course keeping in mind that thins should be balanced so some vegan “junk” every now and then in special occasions, why not!? Now this brought me to this dish, its fast and easy and all round good food! 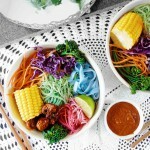 As a rainbow food fanatic this bowl is one of the most comforting foods I’ve had this week. 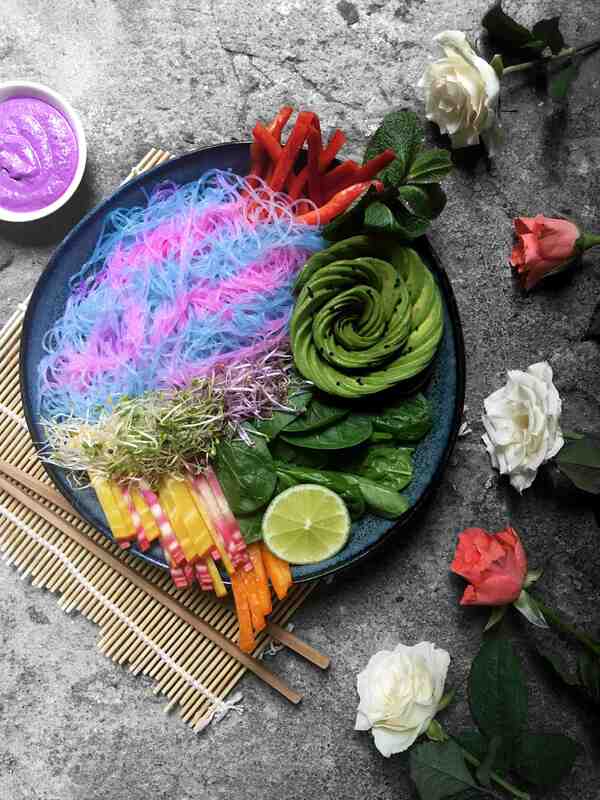 A prefect dish to feed those chakras, am I right!? 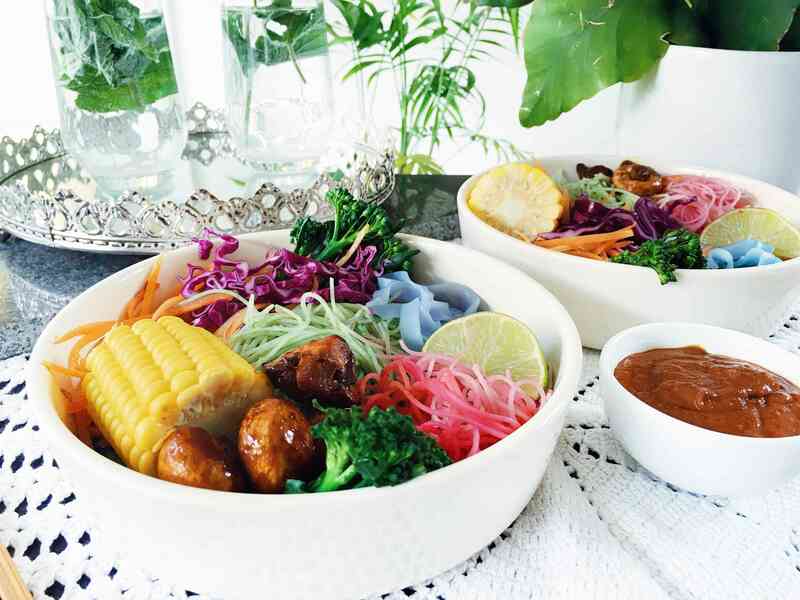 I added a simple and fast peanut satay sauce to the bowl and it was a feast! The fact that the corn, broccoli and noodles all go in one pot already makes this one dish I’ll be revisiting many times I wont feel like cooking. The mushrooms were also very simple, they are cooked with some sweet soy sauce and Sriracha, thats it. 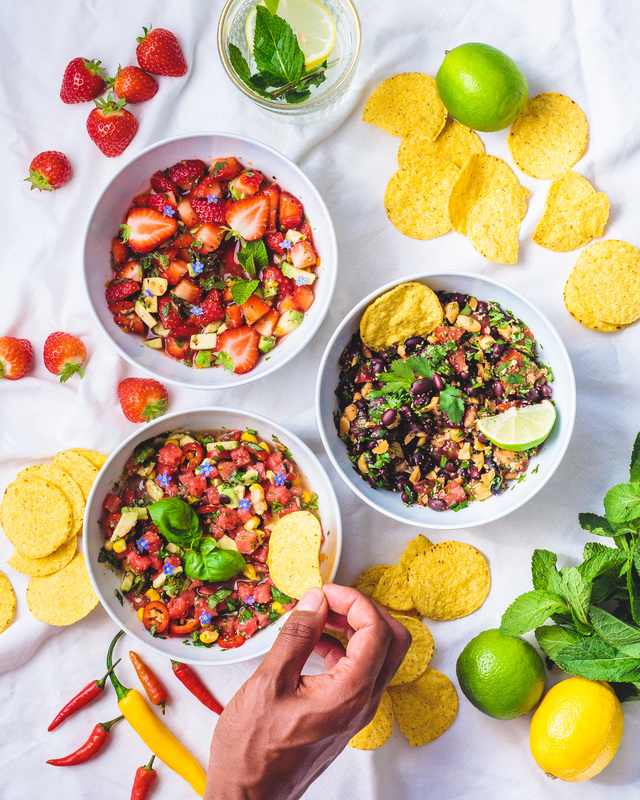 You can choose what type of veggies you’d like to include, maybe you are craving cauliflower or spinach, just add them to the bowl, and if you don’t like corn or anything else you can also choose to leave it out. 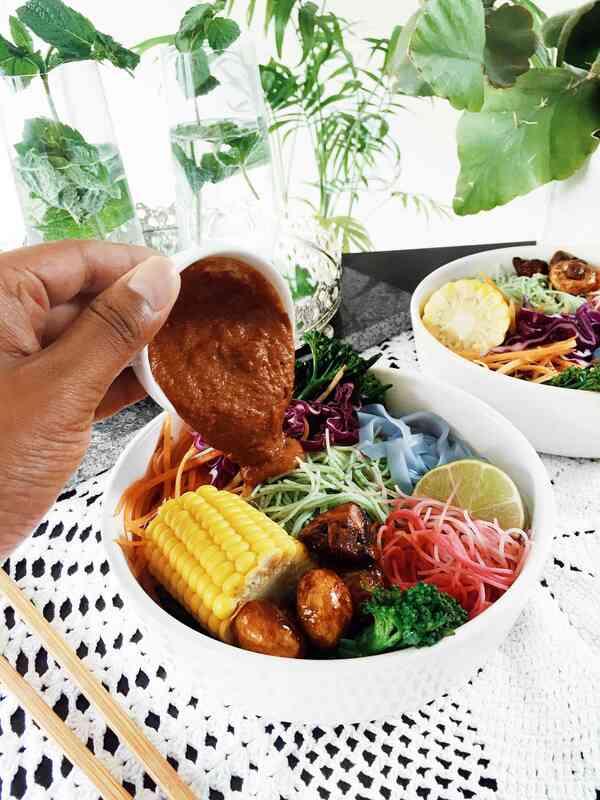 One thing I wouldn’t skip on is the satay sauce, it will put a smile on your face, oh and did I already mention that the sauce is sweetened with dates, bye bye refined sugar! 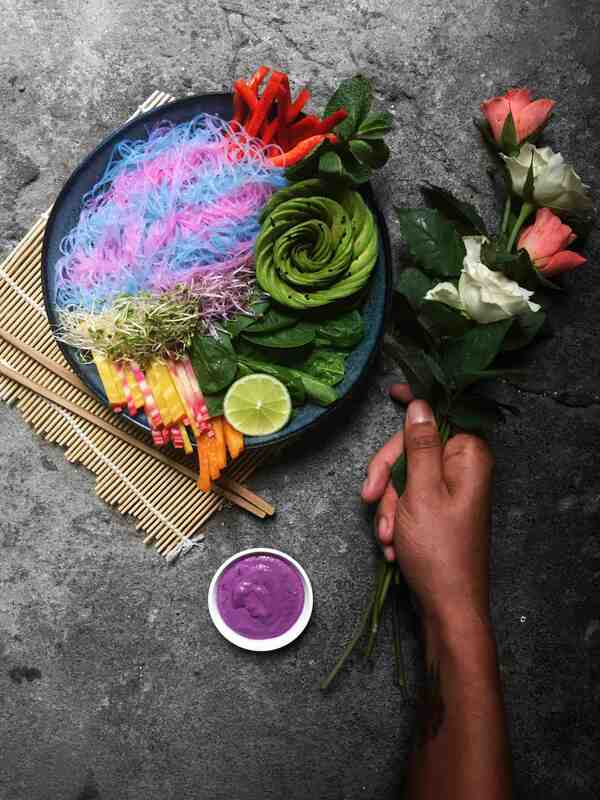 It’s absolutely optional to colour your noodles, but when you do decide, don’t be afraid of spending extra time, I just threw some natural food colourings on the finished noodles and they were done. And the blue one is simply made by soaking it in water boiled with purple cabbage, this is a no fuss kinda dish. Tip: Make the satay sauce while the noodles are soaking this way you’ll safe even more time! 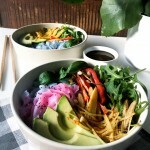 A colourful bowl to nourish your mind, body and soul. Within 30 minutes you can have this no fuss dish all for yourself. to make the satay sauce add everything to a blender (I used a bullet) and blend until the garlic and chilli pepper are nicely incorporated, you might want to add some water for a more thinner sauce. To make the blue noodle I took some purple cabbage and boiled it in some water for about 10 minutes, turned off the heat and added the rice noodles to get soft and absorb the colour from the water. To make the pink and green noodles I brought a pot of water (with the corn) to a boiled the corn for about 5 minutes, now I turned the heat off and added the broccoli and noodles until the noodles get soft. I like my broccoli to have some bite so if you want them a bit softer just boil them with the corn. 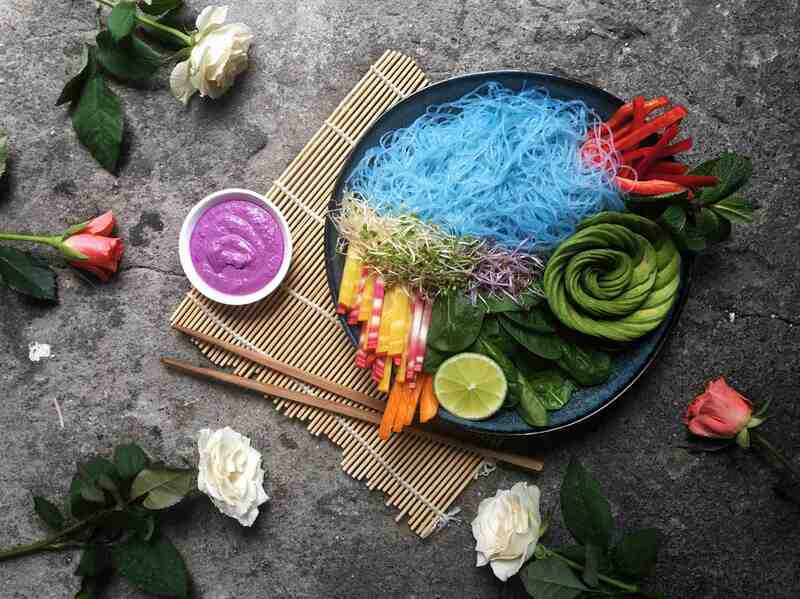 After the noodles turned soft I removed them from the pot and added spirulina powder to the green noodles and beet powder to the pink ones and stirred them around to incorporate the powders. 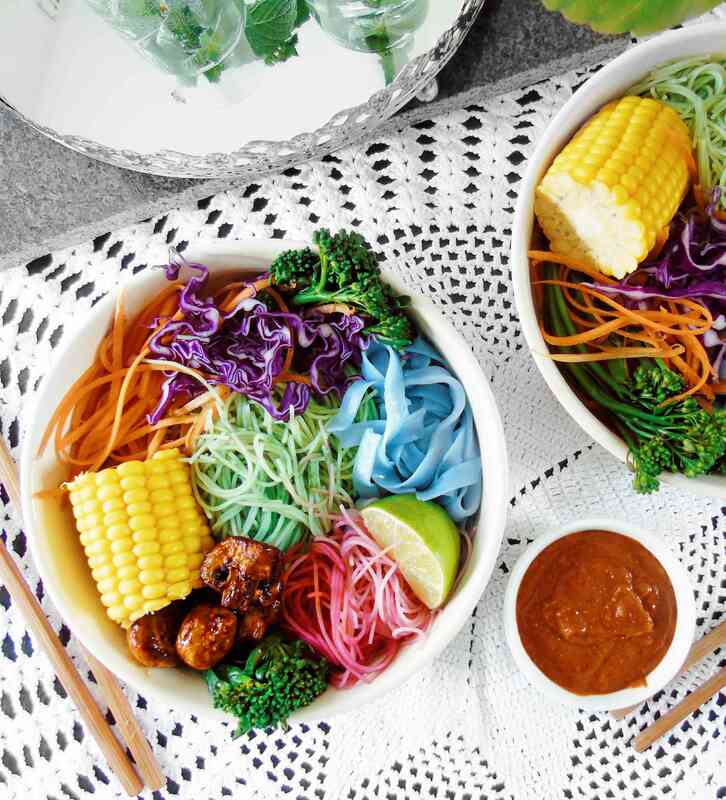 To assemble I added the noodles to a bowl topped with the corn, carrot, broccoli, mushroom I cooked with sweet soy sauce and Sriracha, purple cabbage, lime and finally topped it off with some satay sauce. Enjoy.